Verjus (vair-jhoo, like au jus) is the pressed juice of unripe grapes. Verjus is tart like vinegar and mildly acidic but with a slight sweetness like wine, however, it is not fermented. The French word verjus translated is green juice. It is made from red or white grapes thinned from the vines just when the crop is about to ripen. This early crop of unripe grapes is then pressed and bottled. Because it is not fermented, verjus contains no alcohol. Widely used in the Middle Ages and the Renaissance as a flavor enhancer, verjus has been making a comeback in recent years because of its harmonious ability to pair wine with salad better than vinegar. Red verjus has an earthier flavor, while white verjus has a crisper taste. Bainbridge Island’s Perennial Vintners produces verjus. Sprinkle a bit on your next salad or roasted vegetable and taste the difference. While playing significant catch up on Facebook this weekend I saw a post from Perennial Vintners’ winemaker Mike Lempriere, explaining a change in how he does things at the winery. 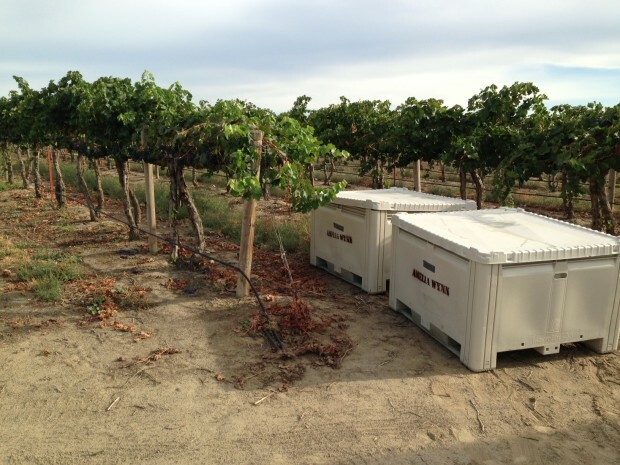 As a result of poor weather the last few summers, Lempriere will begin sourcing some of his grapes from off the island. Until now Lempriere and Joann and Gerard Bentryn, who own Bainbridge Island Vineyards and Winery, were the only ones on the island to manage vineyards on the island. The other winemakers source their grapes from Eastern Washington, where the selection is more abundant because of the climate. The Bentryns have since had to close their winery because of health reasons. For those of you living nearby (in the Puget Sound basin), you’re aware that last year (2011) was “the year they forgot to have summer”. Put bluntly, it was a horrible growing year. A few Puget Sound AVA wineries did do well, however Perennial Vintners, was not one of them — we had a complete loss of crop, due to powdery mildew and just plain not enough heat. Obviously we cannot survive as a business without wine to sell, so we’ve had to adapt and change the way we do business.Until now, all our wines have been grown locally on Bainbridge Island. We will now also be selling wines that came from grapes grown outside of Bainbridge Island. I cannot emphasize enough how difficult it was to make this decision, to break from telling purely the Locavore story, but quite simply there was no choice. It was either close the doors as a business, or sell some non-local wines until we again have local wines available (cross your fingers for a good growing season this year). The good part of this though, is that we will now have available wine types that we have not had in the past. Our first non-local release will be a lovely rose from Pinot Noir grapes. We also have our first red wine coming soon, from Lemberger grapes. We absolutely plan to remain true to our style with more uncommon varieties in unusual styles. We really want to re-emphasize that Perennial Vintners will continue with local Bainbridge Island wines in the future. The core belief of our business is all about local products; we are aggressively working in our vineyards this year to ensure we keep ahead of the powdery mildew that clobbered us last year. We will also soon have a Madeleine Angevine from the Puget Sound AVA, though it was not grown on Bainbridge. If you have concerns about this change, we would love to discuss them with you — please drop in and we’ll talk.